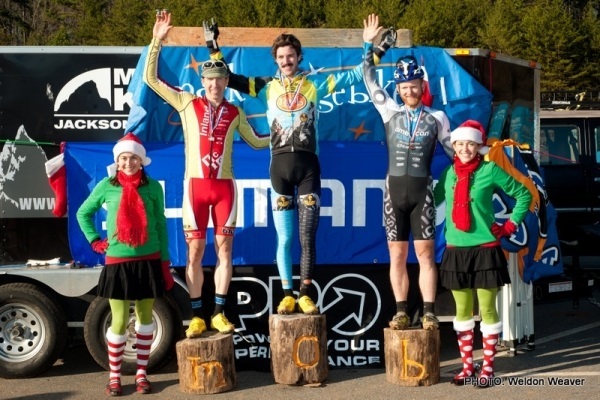 The winner of Race #10 of the NC CX series is crowned the State Champion. SmartStop Mock Orange Bikes p/b Ridley took home both pro titles with Travis Livermon and Emily Shields winning the men’s and women’s pro races. A world class cyclo-cross course was built for the State Championship in Winston Salem’s Washington Park by the crew at Mock Orange Bikes. Course features included a somewhat makeable run-up, a steep downward-bound wooden ramp, off camber turns, chicanes and hurdles. The tough course was perfect practice for riders heading to the National Championships in Madison in January. Marion chased down Myerson with Livermon and Frederick in tow and the group briefly rode together. Myerson attacked again but this time with Livermon. The duo raced together until the final lap and a half. With the one-two victory secure, Livermon soloed to the finish demonstrating his abilities. Series leader, Emily Shields ( SmartStop Mock Orange Bikes p/b Ridley) won the race for the Women’s State Championship title. Megan Korol (Bob’s Red Mill) who started from back, sans call-up, stayed patient and battled her way into the lead, but couldn’t keep ahead of Shields. With a ten second advantage, Shields was conservatively riding the technical sections. She was unclipping from her pedal through the off camber turn, but then aggressively racing the straight-aways. In the end, it was a decisive victory for the series leader. “I got second in both [the series and the State Championship race] last year, so this year I wanted to win them both!” Said Shields.